High Pressure Injection PackageEnabling of 2nd bank of high pressure injection control on Bosch Moto..
Engine Function Package IElectronic throttle control, VVT, Turbo control This is an upgrade for the..
Engine Function Package IITraction and launch control This is an upgrade for the Bosch Motorsport M..
Gear Control Package IGear control Mega-Line functionality, has to be used with MegaLine component..
Gear Control Package IIGear control Bosch Motorsport functionality This is an upgrade for all Bos..
Gear Control Package IIIGear control coordination to external GCU systems This is an upgrad..
Logger Package IExtension for Partition 1: up to 720 channels, fastest sampling 1,000 Hz or 1 synchr..
Logger Package IIPartition 2: 720 channels, 1 GB memory, fastest sampling 1,000 Hz or 1 synchro, lon..
Logger Package IIICopy data of partition 1 to USB data stick, USB-port unlocked• Incl rugged USB fla.. Measurement PackageIncrease to 41 analog inputs This is an upgrade for the Bosch Motorsport MS6.1 a.. The MS 6.1 Bosch Motorsport engine control unit manages gasoline engines up to 12 cylinders. As a me.. 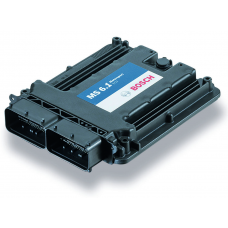 The MS 6.2 Bosch Motorsport engine control unit manages gasoline engines up to 12 cylinder..